The legs were there for the cyclocross champion, but the fortune wasn't: Van Aert picks over a race that could have been. 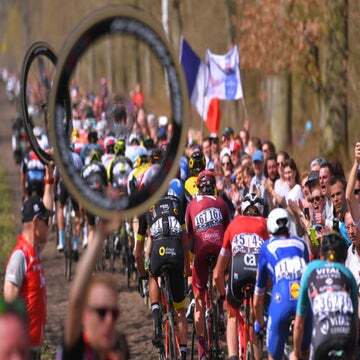 ROUBAIX, France (VN) — Wout Van Aert (Jumbo-Visma) hopes in 2020 luck will be on his side after a puncture, mechanical and crash ruined his 2019 Paris-Roubaix. The Belgian cyclocross star chased back to the favorites twice and paid, finally running out of energy at 21 kilometers to race. When he finished 22nd in the velodrome, Philippe Gilbert (Deceuninck-Quick Step) was celebrating his monumental win. “I had a lot of bad luck, and I felt great actually, so it was really a pity I had to face all these mechanicals and a crash,” he said. The three-time world champion in cyclocross made his big debut in the one-day classics in 2018. He placed third in Strade Bianche, ninth in the Tour of Flanders and 13th in Paris-Roubaix. Much was expected in 2019, and he did not let down fans. 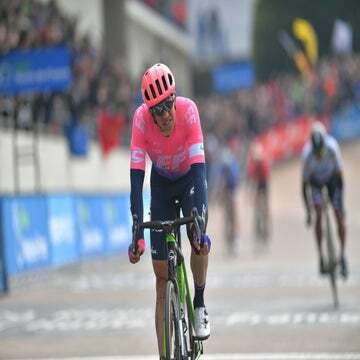 He placed third again in Strade Bianche, went the distance for sixth in Milano-Sanremo and placed second behind Zdenek Stybar in the E3 BinckBank Classic. Hopes were high after having made the main group to fight for second behind solo Alberto Bettiol (EF Education First) in the Tour of Flanders last weekend. 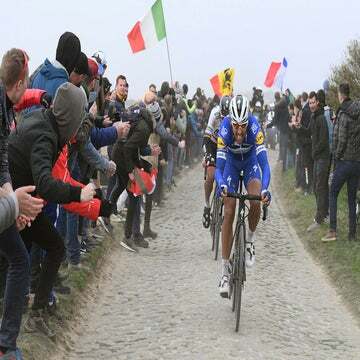 It looked like he could do much better than 22nd in Roubaix, and he thought so too had he not had to spend energy chasing back twice and suffered a crash. He punctured on the cobbles of the Arenberg Forrest and swerved off to the side with Peter Sagan. After a bike change and another, he returned. But a crash at 85km out cost him again. “I had a puncture in front [on the Arenberg sector] and it wasn’t too bad,” he said. Pascal Eenkhoorn gave him his bike and Van Aert fought back. Then he crashed on the pavement and up onto the sidewalk. “I needed a new bike. It took quite a while and I had a bike of a team-mate, came back and when I switched to my second bike on a car, I immediately had this crash. Just [on] a whole, stupid things,” added Van Aert. He rejoined the lead group at 71km to race. Then when Gilbert opened up, he hopped on board and moved free with him, Nils Politt (Katusha-Alpecin), Peter Sagan (Bora-Hansgrohe), Sep Vanmarcke (EF-Education First) and Gilbert’s teammate Yves Lampart. But those stars did not use the same amount of energy that Van Aert did and that showed when he eventually faded at 21km out. One week after cyclocross star Mathieu van der Poel (Corendon-Circus) fought back in Tour of Flanders after a crash, the cycling world focused on Van Aert’s amazing chase. Some began to question Jumbo-Visma’s tactics to not drop back Mike Teunissen or Maarten Wynants to help its star chasing solo. Next week, he ends his classics campaign in the Amstel Gold Race. Later this summer, he is due to race the Critérium du Dauphiné stage race.